Objective: Mild cognitive impairment (MCI) has emerged as a classification for a prodromal phase of cognitive decline that may precede the emergence of Alzheimer’s disease (AD). Recent research suggests that attention, executive, and working memory deficits may appear much earlier in the progression of AD than traditionally conceptualized, and may be more consistently associated with the later development of AD than memory processing deficits. The present study longitudinally tracked attention, executive and working memory functions in subtypes of MCI. 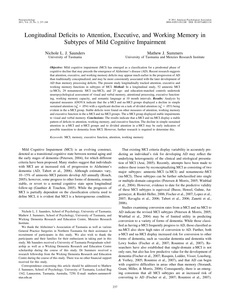 Method: In a longitudinal study, 52 amnestic MCI (a-MCI), 29 nonamnestic MCI (na-MCI), and 25 age- and education-matched controls undertook neuropsychological assessment of visual and verbal memory, attentional processing, executive functioning, working memory capacity, and semantic language at 10 month intervals. Results: Analysis by repeated measures ANOVA indicate that the a-MCI and na-MCI groups displayed a decline in simple sustained attention (ç2p = .054) with a significant decline on a task of divided attention (ç2p = .053) being evident in the a-MCI group. Stable deficits were found on other measures of attention, working memory and executive function in the a-MCI and na-MCI groups. The a-MCI group displayed stable impairments to visual and verbal memory. Conclusions: The results indicate that a-MCI and na-MCI display a stable pattern of deficits to attention, working memory, and executive function. The decline in simple sustained attention in a-MCI and n-MCI groups and to divided attention in a-MCI may be early indicators of possible transition to dementia from MCI. However, further research is required to determine this.